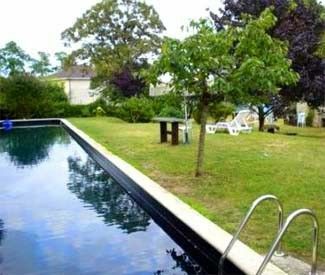 This charming self-catering cottage in the heart of the Loire Valley in Chinon, France is perfect for independent travellers who wish to explore the area’s many châteaux and vineyards. The house is a 15-minute walk to the centre of historic Chinon and all services. The area boasts miles of foot and bike paths along the Vienne and Loire rivers as well as throughout the countryside. On the ground floor, a spacious living room looks out onto a sunny terrace that leads to the private 22-meter lap pool, a shower and toilet are adjacent to the stone-walled kitchen and a library with a sofa bed provides sleeping for two as well as access to the Master Suite via a spiral staircase. The master bedroom is equipped with air conditioning and a Tempur-Pedic memory foam mattress for your comfort after a long day of exploration, and the en suite spacious bath boasts a modern shower, an antique bathtub and a double sink. A Day Out in Paris: Chinon is a 35-minute drive from Tours (train service also exists) and Paris is just an additional hour away on the high-speed TGV (train de grande vitesse) which makes it more than possible to head to Paris for a day's shopping or sightseeing. TGV service also links Tours to Disneyland Paris, Charles-De-Gaulle (Roissy) International Airport, Lille, Poitiers and Bordeaux, as well as London, England and Brussels, Belgium. If driving to Paris, please allow 3 hours. Chinon and the Area: Chinon is a town rich in both culture and history. The old town – la vielle ville – is nestled in between the Château on top of the hill and the river Vienne. For many generations, it was the home of kings and the seat of the government. Interestingly, it was the home of the Plantegenet Kings (yes, of England). Henry II and Eleanor of Aquitaine resided in and kept the Royal Treasury in Chinon. Their son, Richard the Lionhearted, was also born here. Westminster Abbey houses all but these two English Monarchs (and it is said that they occasionally ask for them). The Royal Abbey of Fontevraud, approx 30 km from Chinon, houses their life-sized 'gisants.' This 12th centuray abbey, to which Eleanor retired, is well worth the visit. If you want to get a feel for Chinon and this period of its long history, see the film 'Lion in Winter' with Katherine Hepburn. Rabelais: Chinon was the birthplace of François Rabelais (1494-1553), renaissance man, monk, doctor, philosopher and writer. You can visit his country home, La Devinière, which is just a few miles away. Rabelais made Chinon famous by using it as the centre of his Picrocholine War with his gigantic heroes Gargantua and Pantagruel. There is a shower downstairs for people coming in from the pool (or sleeping in the library) as well as a WC for day-to-day use. Air Conditioning is in the Master Suite only. Yes, BUT, the television is ONLY suitable as a monitor for DVD use. There is a modest collection of DVDs and VHS tapes available. 22 meter long lap pool. Please note that while there is a TV monitor in the bedroom which is equipped with a PAL/SECAM DVD player and a multi-system VCR which reads both US and European tapes, it is not equipped for regular TV viewing at this time. (Regular French TV channels are available via the internet). There are tapes and DVD's on-site for guests' use. Lovely place, great holiday in this charming cottage. All necessary for make a good cooking. Very clean and lots of valuable details. We have one desire, is to return soon. Wir haben einen sehr schönen Urlaub dort verbracht. Sehr schöner Pool. Die Außenanlage hätte etwas schöner gepflegt sein können (Rasen mähen und besonders im Eingangsbereich zur Haustür viel Unkraut, so dass man sich viel Dreck ins Haus trug). Gemütliche Gartenmöbel zum entspannen. Im Haus teilweise sehr hochwertige Ausstattung (Küchengeschirr, WLAN-Anschluss, Klimaanlage, Dampfbad). Störend empfanden wir in der Küche die vielen abgestellten Öle, Gewürze etc., durch die Gasherdnutzung etwas verschmiert) die den Ablageplatz einengten. Auch die im Schlafzimmerschrank und in der Bibliothek deponierten vielen Decken,Kissen und teilweise privaten Kleidungen störten uns. Wir hatten kaum Platz im Schrank. Gleiches galt für den schönen Waschtischunterschrank im Bad, der jedoch voll belegt war. Das Haus war bei Ankunft leider nur oberflächlich gesäubert, so dass wir erstmal durchwischen mussten. Auch die angefangenen Lebensmittel, die sich noch im Kühlschrank befanden, störten uns. Vielleicht sind sind wir da aber auch besonders penibel. Trotz dieser kleinen Mängel haben wir einen sehr schöhen Urlaub dort verbracht. Auch die Kontaktaufnahme mit dem Vermieter im Vorwege erwies sich als unproblematisch und angenehm. Der Ort bietet sich als Ausgangspunkt für viele Besichtigungstouren ins Umland sehr gut an. Auch ein Fußweg in den Ort ist Dank der Nutzung des öffentlichen Fahrstuhls von der Burg in den Ort nicht sehr lang und gut zu bewältigen. Excellentes vacances à Chinon , superbe ville médiévale idéalement située pour visiter les sites du le Val de Loire. Remarquables restaurants et innombrables vignerons aux alentours. La maison allie le charme rustique au confort moderne. Superbe piscine ( plus de 20 mètres de long !) idéale pour nager mais inadaptée aux jeunes enfants. Cuisine parfaitement équipée, meubles confortables et fonctionnels, internet. Excellente literie dans une chambre avec air conditionné. Douche multi-jets. Le voisinage est très calme et la terrasse à l'abri des regards. Les animaux sont acceptés, notre chat semble avoir également apprécié la maison et le jardin. Amoureux de la région, nous avons trouvé notre base pour y retourner probablement l'année prochaine. A wonderful holiday Chez Tim! Upon arrival, found everything was exactly like the pictures, only better in real life. A very comfortable and functional home to stay at. We loved the pool, the water was crystal clear and warm. Just the thing after a day of sightseeing. We were very pleased that the house was clean and found everything we needed for preparing meals. Great idea having a shower downstairs after being in the pool. The bedroom and bathroom upstairs are really great and the bed rates at the top. The living area is relaxing and easy to keep tidy. The area that the house is in is very quiet at night. Thanks Tim. Will definitely go back for more sightseeing. This house is in a really nice area, the town of Chinon is only a few minutes away, with good restaurants, bakery, chateau etc. There are also many, many vineyards selling excellent wine at very reasonable prices, so go with an empty car! The house is basic but kept clean, good shower and nice deep bath. There is a dishwasher, and washing machine which is very handy! Internet access is free, which was handy as we couldn't get the TV to work, we did manage to get it to play DVD's though, and there were quite a few to choose from. Bedroom had air con which was good after the hot days, comfy bed and plenty of space in the room. Personally I would have preferred it if the condoms (presumably from previous holiday makers) were hidden in a drawer/disposed of, rather than left on top of the bedside table. They were unused, but I still felt it rather inappropriate. The garden is pretty average, there is no 'lawned' area. The area around the house is mainly weeds with a few wild flowers, the area around the pool does have some grass. We didn't dare go bare foot though as we picked up a lot of broken glass over our stay. The pool is fine, temperature seems to hover around 26C. This self-catering cottage is just a short walk from the center of Old Chinon and the Chateau. Chinon is only a short drive to numerous other châteaux, including Azay-le-Rideau, Chenonceau, and the Royal Abbey of Fontevraud (now the Cultural Center for the West). The Cadre Noir equestrian centre is a short drive away in Saumur. The area is also rightly famous for the quality of its wines and the many vineyards are well worth the visit. Chinon, Bourgueil, Vouvray are just a few of them. Chinon is in the middle of a UNESCO protected area and there are hundreds of miles of trails for hiking. On a more practical note, there is food shopping within easy reach as well as a movie theatre, cafés, restaurants, banks, post offices, Tourist Information Centre and lots of little shops (Thursday is Market Day) - all conveniently at hand. At present, the property is available for rental July through mid-September.